Henri Masson was born 10 January 1907 in Spy, a small village near Namur in Belgium. He started his studies at the Athénée Royale of Brussels when he was 13 and from then on all his spare time was devoted to drawing and painting. After his father died in 1921, he and his mother immigrated to Canada, settling in Ottawa. He started working in an engraving studio in Ottawa in 1923. He also took courses at the Ottawa Art Association and the Ottawa Art Club. He earned his living, as an engraver until 1945, ensuring the security of his family, which he explained, was vital considering that he had three children and was not by nature a bohemian. This was also a period when few artists were able to make a living by their art alone. Masson therefore worked at the engraving studio during the day and painted in the evenings and on weekends. Masson first exhibited in 1933, a group exhibition to which he submitted a selection of watercolors, pastels and drawings. His first showing of oil paintings was in 1936 in an exhibition at the Ontario Society of Artists in Toronto. The Masson household was a beehive of activity and an interesting mix of friends met once a week to discuss music, painting, politics and the state of society. Eclectic, cultivated, open-minded, Masson could be the heart and soul of any gathering. He talked about music as a connoisseur, he was well informed about politics and he could hold forth easily on travel and other interests. He discussed painting in simple terms, very much in the manner of the paintings he produced. For Masson, everything was clear, simple and orderly. It is not surprising that he followed his own inclinations, independent of various trends developing in the arts in Canada. His quick and outspoken manner on occasion caused some controversy, but there was never any contradiction in his paintings or in the consistency of his work. In 1937, on the birth of his first son, Carl, Masson exhibited at the Caveau. His first solo exhibition was held at the Picture Loan Society in Toronto in 1938, followed by another solo exhibition in 1939 at the Caveau. He also exhibited with the Canadian Group of Painters as well as exhibiting in New York and Montreal. Masson started exhibiting at the Galerie L’Art Français in 1941. That same year, he became a member of the Canadian Group of Painters and joined the Canadian Society of Painters in Watercolor and the Société des Arts Graphiques. In 1944, with H.O. McCurry, A.Y. Jackson and Arthur Lismer, Masson adjudicated an exhibition of war art held at the National Gallery of Canada. He also exhibited his paintings at the Yale University Art Gallery in New Haven and the Fine Arts Museum of Rio de Janeiro, Brazil. Still in 1944, The National Film Board discussed Henri Masson and his art in a documentary film. He was elected president of the Ottawa branch of the Federation of Canadian Artists in 1945. Masson taught at Queen’s University Summer School in Kingston from 1948 to 1952. He returned to Europe in 1952 for the first time, visiting his hometown in Belgium. In the summer of 1954, he taught at the Banff School of Fine Arts and in 1955 he was granted an Honorary Doctor of Laws Degree from Assomption College in Windsor, Ontario. That same year he taught at the Kingsmere Summer Festival along with A.Y. Jackson. 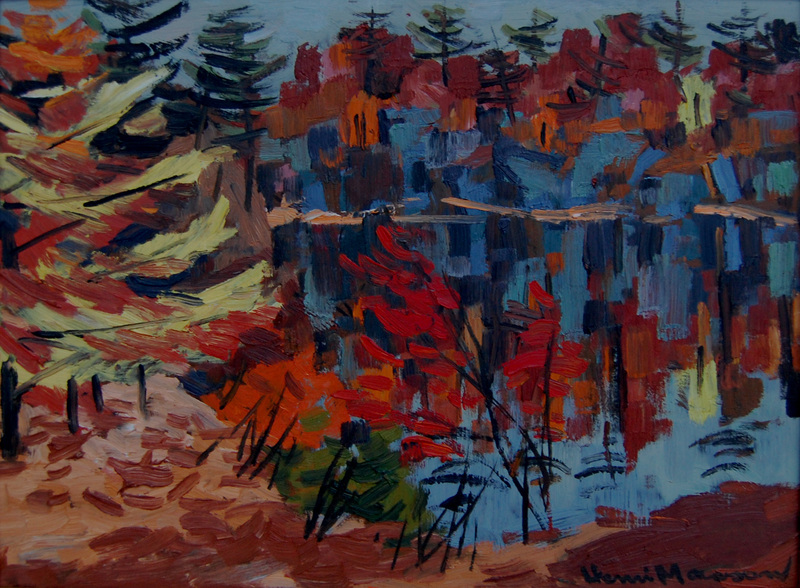 His painting, “Logs on the Gatineau River,” was reproduced for the cover of the Canadian Geographical Journal. Masson returned to Europe in 1957, this time travelling in Italy, France and Belgium. From 1960 to 1963 he taught summer courses at the Doon School of Fine Arts. He illustrated an article on the quiet revolution in Quebec, “Quebec in Revolt,” that was published in Fortune Magazine. In 1973 Masson travelled to the Soviet Union. In 1975 he participated in an hour-long radio interview at Radio-Canada. He travelled to the Orient in 1976: Japan, Taiwan, Malaysia, Thailand and Hong Kong. In 1979 the municipality of Sainte-Catherine d’Alexandrie honored Masson, naming a street after him. In 1980 Masson took part in Radio-Canada’s television program “Rencontres,” and as part of the L’Atelier series, he was also interviewed by Naim Kattan of Radio-Canada FM. Masson is first and foremost a landscape artist. He paints from nature; trees, villages, the sea, lighthouses and small boats. It is easy to see from his work that Masson liked old houses and street scenes. He did not look for the spectacular but for local neighborhoods and back yards. He was particularly interested in French Canadian history. Although Masson painted European landscapes, he was essentially a Canadian who painted landscapes depicting the Ottawa region, Gatineau and especially the province of Quebec: Gaspé, Charlevoix (notably Baie St. Paul), the Eastern Townships and the Laurentians. Masson sketched outdoors, always conscious of the purity and light of the diverse tones in nature. These sketches were the starting point for the paintings completed in his studio. His sensitivity, his expertise and his love of nature and humanity transformed everything he touched. Under his agile brush even the most mundane subjects became exciting. In 1940 the art critic Marious Barbeau noted that the artist was interested in the inhabitants of the countryside that he explored, preferring scenes where people were at work or at play. He described Masson as a chronicler and a landscapist. In the eyes of many critics Masson was the perfect artist, reflecting all the qualities attributed to Canadians in his art. In the 1940s critics extolled Masson’s realism, the intensity of his color and his gift for satire. The critic P. Gélinas, writing in Le Jour, congratulated Masson for not following the current fashion in art, developing his own vision rather than choosing a middle ground between cubism and surrealism. He also noted that Masson had a sense of luminosity, an understanding of the drama of autumn, the tragedy of the wind and the indefinable mystery of light. In the eyes of the critics Masson was one of the best watercolorists in the country. Masson gave to everything he touched a dynamic and vigorous force. His paintings, often joyful, are richly descriptive and his sharp eye for detail is reflected in whichever medium he uses. By 1943 Masson was at the height of his talent. He drew the attention of his viewers through the color and movement in his work. He used bold colors brilliantly and with obvious pleasure. Nevertheless, there is a subtlety to his art. The uniqueness of his composition emphasizes the artist’s individuality to the point that critics are inevitably taken by the overall excellence of his paintings. In the course of numerous discussions about his work, Masson said of his paintings that with experience his paintings changed and evolved with the passing years. This happened slowly, almost imperceptibly. When he was painting during the years 1945, 1946 and 1947 he said that he used colors that were more somber, and that his work was more graphic, his paintings more austere. He also said that he painted subjects that allowed him to display his understanding and personal vision.